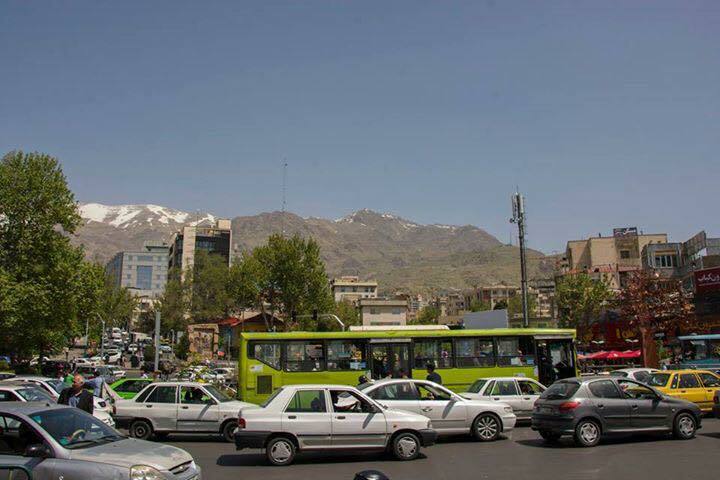 A lot has been written about the taxis in Iran and there is even a movie called “Taxi Tehran” by one of my favorite directors Javar Panahi. Travel guides and friends usually recommend to take the official green or yellow taxis because they are safer than the unofficial ones and you know what you pay. Still I have rarely seen an official taxi with a taximeter and you still usually negotiate the price before leaving to your destination. As there regularly is a confusion happening with the two currencies Toman and Rial (1 Euro is around 39000 Rial or 3900 Toman with exchange rates changing on a daily basis at the moment) a good way to go is to ask the drivers to show the required amount of notes before they set off. 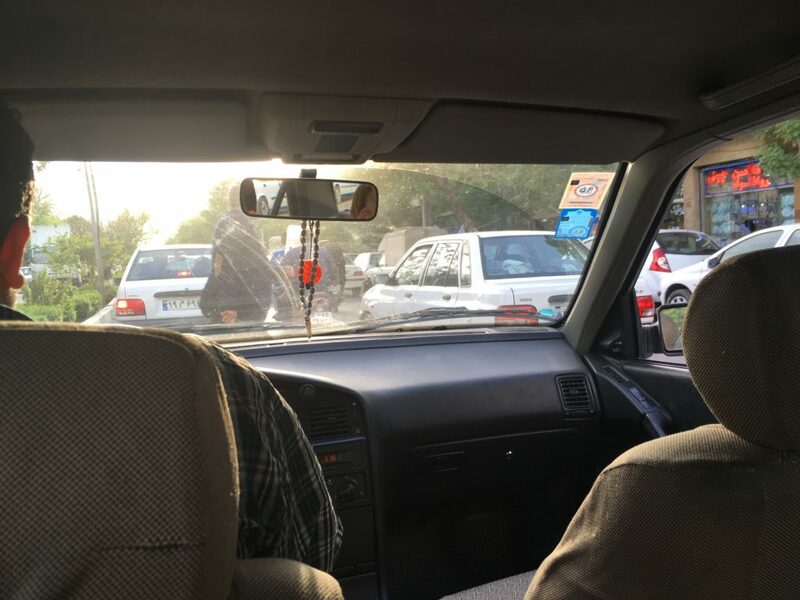 With around 15 million people living in greater Tehran, around 4 million vehicles moving around in the city every day and taxis usually not meeting European safety standards, a taxi ride is an experience. One of the few things I don’t like about traveling alone is to get from the airport to the hotel by taxi at night. Don’t know why, but that’s one of the things that makes me feel uneasy, especially when I can’t read the street signs. I usually try to avoid it by taking a flight during day time. If I can’t avoid a night flight though, I set the location of the hotel in google maps while I am still online and then check the current location regularly during the taxi ride. That way I am at least sure the taxi is somewhat aiming into the right direction. My flight to Tehran was supposed to land at 2am and to avoid going alone on a taxi I tried to find someone on the travel forums who would share it with me. I connected with an Icelandic guy who was arriving approximately at the same time and was coincidentally also staying in the very same hostel in Tehran. We agreed to meet inside the airport and then share the ride to the hostel. My immigration process at the Tehran airport was quite smooth as I got my visa prior to my trip at the Austrian embassy already. So once I was through the border control I sat down to wait for that guy. 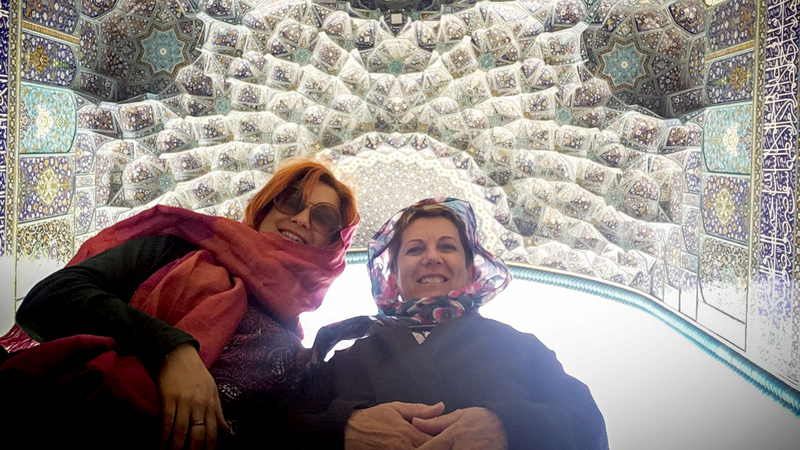 He described in our chats how he looked like and what he would wear, and with bright hair and complexion he should be rather easy to spot among the Iranian families waiting for their loved ones arriving from Europe. After half an hour I spotted a display with the flight numbers, hidden behind the escalator and I realised that some European flights were arriving in a different area of the airport, so was his flight. So I walked over to the other waiting room and joined the group of Iranian families who were holding massive flower bouquets and small kids in their arms and were dressed up as if they would join a wedding. And kept waiting and waiting and waiting. After more than two hours I decided to leave and take a cap by myself. A handsome taxi driver approached me and offered a ride for a correct rate and also to take Euros (another advantage for me as I didn’t exchange money yet). We set off to the address I was given by the hostel and I had to focus a lot to not fall asleep. 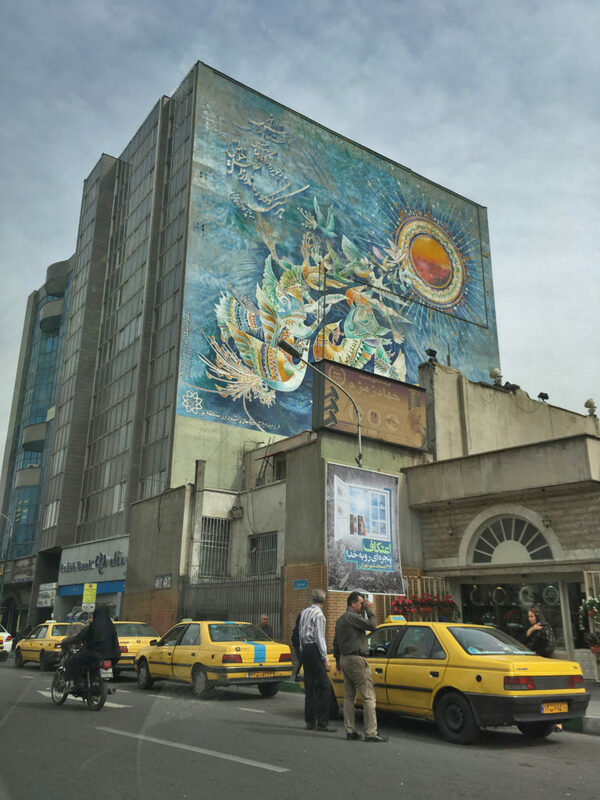 On the huge motorway that was almost empty during that time of the day, we passed by massive billboards, brightly lit mosques and apartment blocks before we got to the city center. Iranian addresses are often written with the addition “dead end” as the house lays in an alley with just one way in. So is this hostel. The driver kept driving in circles and again and again asking me for the address. I have learned online before my trip that the taxi driver usually needs the address in Persian letters as he won't be able to find it if written in Latin letters. I took a screen shot of the address in both versions and handed it to him. Still we kept on driving a street down, then a few blocks further up again. I looked at my mobile screen. The location indicator in Google maps kept dancing on the screen, we were just a step away from the house but still didn’t seem to find the way there. Finally after another ride down a whole street in reverse gear, we stood in front of the hostel at almost 5am. I payed and entered the lobby and to my surprise found the Icelandic guy there waiting for his key. He was waiting for his visa at the airport for over two hours, but then had a driver with a better sense of orientation. So in the end we got to know each other in the hostel and after a safe trip. The first day in Tehran Aleena (my travel buddy), I and a Danish girl that met in the morning at the hostel spent mostly walking around in the city center. The new surrounding, walking, heat and the little amount of sleep made us feel pretty worn out. So for the way back we decided to take one of the plenty taxis, that are usually parked in the second lane on the main roads. Once we approached one of them and showed the driver the address, other drivers joined in and the discussion on who will drive us started. Finally one of the older drivers seemed to have won the discussion or maybe just knew the address and guided us to his taxi. We encountered the same kind of scene during the whole trip over and over again, and sometimes it seemed that whoever won the discussion just hopped into one of the taxis parked there and set off with the new customers. Again there was no taximeter in the car, so we negotiated the price and off we went. 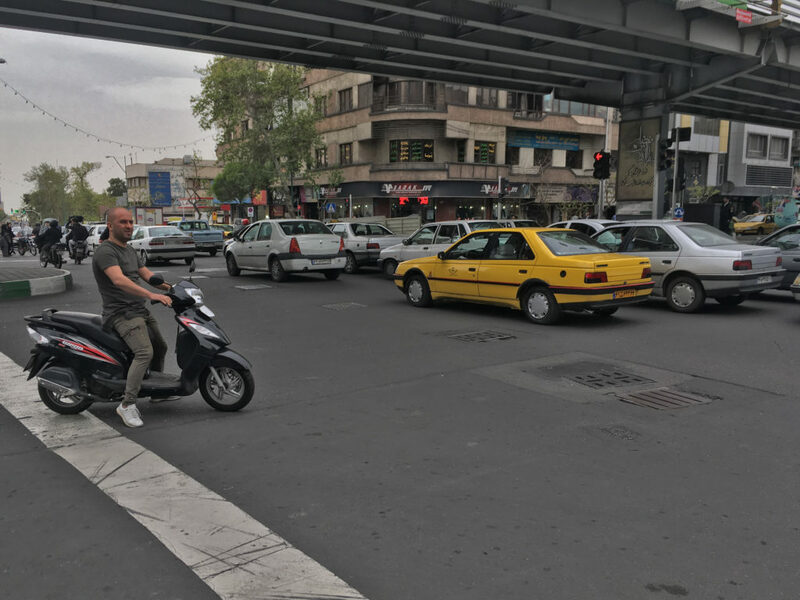 Now we got a good idea of the driving style of Tehrani taxi drivers and most of you who travelled to the Middle East or Southern Europe know that scene. On a two lane street, three taxis would often squeeze in next to each other. Frequently the distance between two moving cars was less than 10cm mirror to mirror. Changing lanes felt and looked pretty scary – the driver would, accompanied by the sound of an orchestra of horns, just drive through a gap in the queue that seemed far to small for the car and just cross three lanes in one go. Sometimes we didn’t want to look out of the side window anymore. If drinking would be officially allowed, there were several occasions when I could use some “emergency drops”. 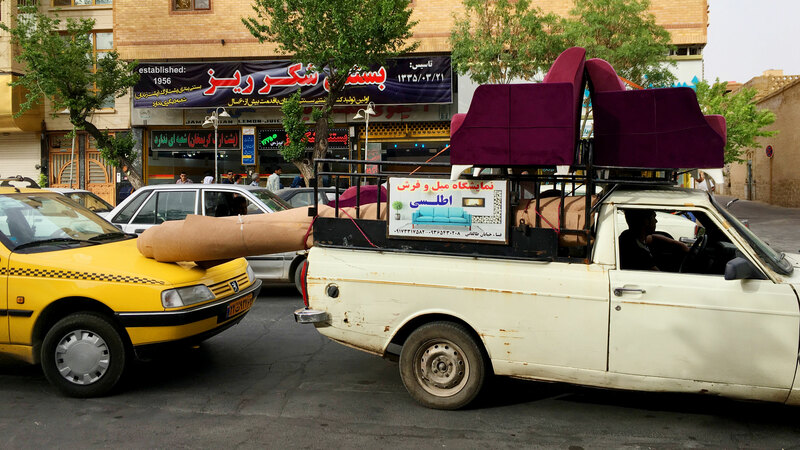 But Iranian taxis have one advantage. They are often at least 20 years old and the leather of the back seat is softened by thousands of passengers hopping on and off, and the seat so worn out, that you automatically lean back and sink into the seat. In all that traffic chaos that posture, kind of forces you to feel relaxed. 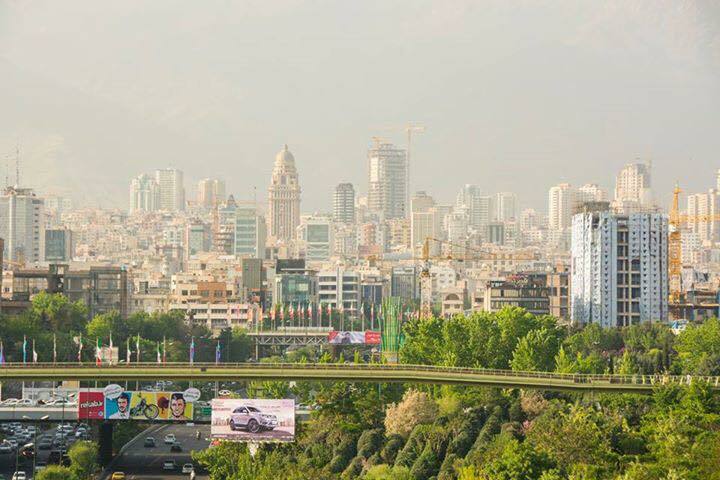 On one of my last days in Iran, I stayed with an Iranian family in the North of Tehran, one of the modern and wealthier areas of the city, but also a quite hilly one. So getting to and from the flat required a bit of fitness. I had an appointment with a friend of mine in the afternoon and the mum of the family was on the way to her husband’s family. My meeting point was just on her way and she decided to accompany me – so we walked downhill. I in the shirt dress that I converted into a manteau (the long-sleeved kind of coat that Iranian ladies wear) and with my headscarf and comfy shoes. And next to me, this incredibly stylish, elderly lady, balancing on her high heels (also wearing the compulsory scarf and manteau). At a street crossing she stopped a, what felt like a random, car and we hopped in. She said something in Farsi to the driver and at the next traffic light handed him a few notes, a fraction of what we would have paid by taxi. Then she whispered towards me “this are the unofficial taxis, everybody uses them” and then “act just like a friend”. So she and I and a young lady that sat already on the passenger seat before, drove with the that stranger and pretended to be friends. A friend explained later how these so called “savaris” work – basically any private car can be a taxi. The driver of a savari horns whenever he approaches a street crossing and sees people waiting. If they need a ride, they indicate it and hop into the car, tell him the destination and fix the price. So on his way from A to B, people hop on and off and he earns some money. I encountered a similar system on an official taxi a few days later. I was alone on the cap and we passed by a young girl who was waiting on the sidewalk. The driver pulled the car to the side and asked her about her destination and then to join us. The drivers basically allow people, usually women, to share the ride with a passenger they already have on board, often for a reduced price or for free. I later read that you can tell the driver when entering the cap, if you want to have it all for yourself (dar baste) or he can let other customers join in (ma dar baste). So in that case I should have also paid a reduced fee. 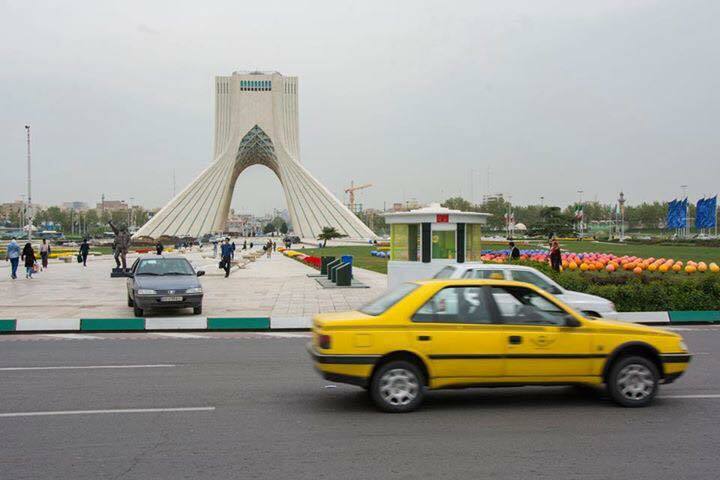 Another reason to learn a bit more Farsi, to be able to negotiate taxi fares better.